That no one could understand. It would all be a shade more bearable. Before hypothyroidism took over my life. Could have saved my child. Published in 2004 in the Journal of Counseling Psychology. And it’s what saved me. When they really have no idea. Sadly too many that didn’t. More energy than a 20 year old. My sons proved them wrong. There are millions just like me. That you become barely YOU. I’m 36 years old. 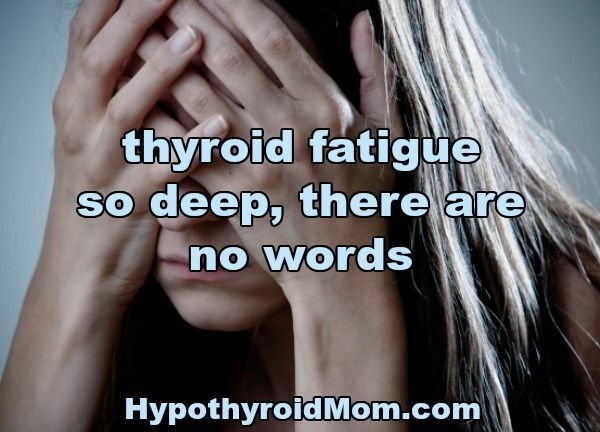 I was diagnosed with hypothyroid at age 18. My TSH was 35. Looking back at pictures of me at age 15 compared to age 16 I can tell my thyroid was acting up between those ages. Around 20 I was diagnosed with hoshimotos. I am soooooo tired. I wake up tired. AlwAys. If my thyroid were to suddenly go into remission or if I found the right dosage of medications I think I would think something was wrong with me. Meaning, I don’t know what my “normal” feels like. I have NO idea. Would I be more involved with my kids? Would it not take two days for me to recover from working three 12 hr shifts in a row? Would I be able to keep up with the housework? I don’t know. I’d like to know. 20 supplements? Is that on top of your thyroid meds or in place of? Hey Dana, You probably wouldn’t remember me, but I was best friends with your late cousin Lisa in High School. I stumbled across your blog and it’s truly amazing. You’ve done some incredible work here. I’m so sorry about the loss of your baby. wow Caren! Of course I remember you. I actually mentioned your name to Lisa’s sisters at her funeral. If I recall they told me you moved. I miss Lisa. What a loss to the world to lose a good woman. Hi Dana – thanks so much for sharing this. I can relate to the fatigue, weight gain, hair loss and overall fog. I looked at the supplements you noted – do you take all 20 listed there? Do you have a recommendation for which to try first? Please list the supplements. Thank you! I am 76 years old, 100 pounds over weight, have noooo energy and could sleep 20 hours. Same story — doc says my levels are in range and blood work good. But none of this is any good . I know that I am going to die before my time because of this. I have all the symptoms described by everyone and none of the doctors want to listen. Help !!! Linda get the 5 blood tests done immediately. I went to a integrative medicine doctor. For yrs I only had TSH done I was critically low in T3. So on cytomel now. I am 70 yrs old. You need to take care of YOU. I have been on Synthroid for yrs also. I have two girls (25 and 18). I had miscarriage after miscarriage and gained 90lbs but my GP insisted my TSH was normal. Then I gained another 70lbs and felt terrible – everyone said it was because I was fat. I have horrendous depression, anxiety, tiredness, lethargy, heart arrhythmia, aortic valve stenosis, b12 deficiency and periods so heavy I couldn’t leave the house. I had one 26cm fibroid and several 16cm fibroids but too fat for surgery. TSH constantly normal. Then last year a new doctor came and did more blood work. My TSH was 50. I am on levothyroxin but feel no better – my TSH is between 6 and 10. My joints hurt soooo much, my skin is so dry on my body that it actually sheds off, my hair is thin and dry (I have no body hair at all anymore) and I can’t shift much weight, no matter how little I eat.i have to have my heart fixed soon and am terrified. I’ve never had a thyroid scan. I honestly feel like I am in a waking nightmare. I knew something was wrong. I was taking my levothyroxine. But gaining weight like crazy. I’m exhausted. I’m depressed. No one heard me or at least that’s how it seemed until my last blood test. My TSH was 75. My Dr had no idea how I was standing much less functioning. You know the saying, fake it til ya make it? I felt like I was faking it everyday. Changed my meds to NP but my reaction to it was so severe that I’m back on Synthriod. Ugh. But I’ll keep going. What are the 5 tests? I just got diagnosed with this and am trying to learn all I can. Thx! My levels lately are normal. Quite unusual. I usually have my dosage of Synthroid changed 2-3 times a year. Although my levels show normal I still have all the symptoms of hypothyroidism. The insomnia, aches and pains, headaches, fatigue, cold intolerance (wearing pants in summer in Alabama because I get cold in places) and the list goes on. I am a mom of a 21 and 17 year old. I also keep my 3 year old niece quite often. I just don’t have the energy I need to be the best mom, aunt, wife, and employee that I can be. I miss being active. I had my thyroid killed in 2003 and then another dose of radioactive isotope given and killed it more from Graves Disease. No one knows the horrible feeling unless you have experienced it yourself. It’s funny the Doctors said your levels were fine but then said you would never have another baby b/c of your hypothyroid. It is horrible to experience but glad to have information from people like you. Hi Betty, I’m happy you’ve found something that helps. I do not permit posting adds for products and services at Hypothyroid Mom.